This was RIDICULOUSLY HARD. There was so many factors to consider --- like length of time on the island (would this be like Survivor game show length or Gilligan's Island length?) and would I want something familiar that would comfort me or would I want something NEW? 1. War & Peace by Leo Tolstoy: This is one of those books I'd love to read but really just doubt I'll get to in my life. I'd have no distractions, no toppling-over-TBR list so this big boy and I would have some quality time together. 2. East of Eden by John Steinbeck: I have had this on my shelf for forever and REALLY want to read it but I'm so darn intimidated by it. 3. David Copperfield by Charles Dickens: In addition to its thickness, I can't die without reading Charles Dickens. 3. Lord of the Rings by J.R.R. Tolkien: It's a big book plus one of the most epic adventures. It took me freaking forever just to watch the movies and they were the longest movies I'd ever seen. BUT AMAZING. On a deserted island, I could read the adventure for myself. 4. Harry Potter by JK Rowling: Ok, firstly. I'm cheating and making this one choice. It's my shipwreck, I CAN DO THAT. ALSO...ummm...I'm trying to hide this under the title of "adventure" when really it should be that I don't think a human being should be stranded on an island and have to think about how they might die never reading one of the most POPULAR series EVER. 5. Pride & Prejudice by Jane Austen: Nothing can make me swoon & clutch my chest like a little Elizabeth & Darcy. Plus it's a favorite so there's that. Really I'd just want the Complete Works of Jane Austen so that I could finish reading the ones I haven't read! 6. The Notebook by Nicholas Sparks: Yeah. I'm a sap but I love The Notebook and I love their romance and it'd be a guaranteed ugly cry. 7. Either Lola & The Boy Next Door or Anna & The French Kiss by Stephanie Perkins: Her books MAKE ME HAPPY. And plus their is swoony romances. Lola was my favorite but I'd also be daydreaming about Paris. 8. Sloppy Firsts by Megan McCafferty: This book has made me laugh out loud like NO OTHER. I'd need to laugh...and not like maniacal laughter as a result of going crazy. Just the giggles that Jessica Darling's brain gives me. 9. Fifty Shades of Grey by EL James: YEAH, I went there. Why would I bring this as one of ten books I may ever be able to touch again?? WELL. As someone who hasn't read this book, 1) it would be new to me 2) If I'm going to die..I may as well die knowing why the craze is happening 3) I COULD get a good laugh out of it which YAY ENDORPHINS 4) Let's say I fall in love with it like others I know...YAY ROMANCE & SEXYTIMES 5) If all else fails and it really is as god awful as I've heard it is and that I THINK it probably is...I COULD USE IT FOR FIRE! Fire = key to survival. And then if I can survive I can read ALL OF THE BOOKS to get that book out of my mind. It's a win-win really. 10. How to Survive Anywhere: A Guide for Urban, Suburban, Rural, and Wilderness Environments by Christopher Nyerges: Hopefully there would be useful things in here to help me survive and the non-applicable part would be used for fire. WARMTH! So there you have it! These are the books that I'd be left with on a deserted island. I didn't want to just go with favorites but with things that would get my mind off it by being longer or something I've never read..mixed in there with a couple faves. Boy that was hard...the only deserted island I want to end up on is one that involves Jeff Probst and some hunky men who can build me shelter and I can potentially win a million dollars. I switched the topic up a little bit different for my personal book blog (The Perpetual Page-Turner) so come check it out! Ha! I love your picks. I very nearly included LOTR and Anna and the French Kiss on my list too. And I love your 50 Shades reasoning. Good to have something you can burn without guilt. YES. That's what I figured. Eventually I'll figure out how to make fire soooo that's the one. Your 50 Shades reasoning was great. Personally, I think books will be waste since Sawyer from Lost will be on my island, but whatever. I LIKE YOUR ISLAND!! Love me some Sawyer <3 <3 Those dimples! W&P was on my list too, but I love East of Eden. The size is intimidating, but seriously, the first time I read this book, I knocked it out in two days. One of my very favorites. YAY! This makes me more likely to read it NOW then! PRIDE & PREJUDICE! I didn't even think of that! And Fifty Shades of Grey, LOL. Nice idea of using it for fire too. I'll send P&P via carrier pigeon to your island! Somebody had fun with this weeks topic ;D You're set for pretty much everything haha. Throw some hunky men on my island too, woohoo! I love the blog's new look, by the way! LOVE your list! I totally had the same train of thought but instead of War and Peace my "book I want to read but don't have time cuz its a bajillion pages long" was Les Miserables :) East of Eden has also been on my TBR shelf forever but just didn't make my island list. I love how you broke them down into categories why! I had War & Peace in the first time I did this topic so I threw Crime & Punishment in for Russian tragedy this time. Do you really want one of the last books you read to be 50 Shades? Haha. I just finished 50 Shades of Grey and ugggggh was it painfully, so I just you psych yourself up for fifty shades of fire fuel. I also would need some incredibly fat books. Why hello there, gigantic French books that I want to read but never get around to! I was totally thinking, hey when did I miss you reading Potter but yes that's a good reason to take it haha. Love your list and so LOVE the new blog design so gorgeous! This is a great list (though now I'm lamenting the lack of Stephanie Perkins on my island) and far more thought than I employed. I just grabbed books I couldn't live without, throwing in the whole of Austen because I would need that. For survival. I was going to add TBR books but then what if I didn't like them? I would be stuck on a deserted island with a book I didn't like (the horror). Yes, Jane Austen, Leo Tolstoy, JK Rowling- they all made it onto my list as well. I loved your explanation for why all those books were necessary. I love that you chose the classics and a survival guide. And you are so right that if the one book doesn't make you fall in love or bring you many laughs it would be good for a fire. Even though the whole concept of burning books makes me cringe I have a feeling if I were to read it, I'd cringe more from reading it than destroying it. And I hope you plan on including all the HP books and not just the one because I think it just wouldn't be the same without the entire "adventure." Ha Ha! Loved the bit about using 50 Shades for firewood! Here's my Top Ten picks for a deserted island! I love your number ten! Darn! Didn't think of Fifty Shades of Grey! I'd totally read that on a deserted island. Like the rest of the literate world, I picked Harry Potter. But my last pick was actually... a blank notebook! What a great list! I like your reasoning for why you picked each book. Very thoughtful and balanced. This was a lot of fun! Thank you for the idea. I added Harry Potter as a set as well. I couldn't imagine not having it as a set. I never thought of taking Fifty Shades to use to make a fire! I love the new look! Very fresh. "because i'm going to die anyways so wtf-ever" - Fifty Shades of Grey. LOL. I totally agree on having LONG books to pass the time. Game of Thrones is another good option there. I ALSO love the new look. To die for! No. 10 is highly useful, I never thought of this. Great picks (Minus no. 9 - what if it turned out you didn't like the books at all? You'd throw away a few precious days). Hahaha, I'd probably use Fifty Shades to make a fire :p but for me, they are a waste of space and I want to bring good stuff ^^ Great list! P&P and HP both made my lists, as did a Stephanie Perkins book. Great minds think alike, I suppose. Yeah, I put War and Peace on my list as well. I've always wanted to read it, but like you, I would need that time and focus away from other people just to get through the thing. Great list! Great list. I mixed mine up a bit too between adventure, fantasy, and romance. Your reason behind bringing FSoG is just awesome! Totally makes sense and you really can't go wrong. Ooh, what a great list. War and Peace has been on my TBR for a long time. No doubt that that one would keep you going for awhile. It's a whopper. LOVE your subheadings! I didn't think about adding a book that would make me laugh - such a great idea! Your Fifty Shades logic had me laughing! Great list. Excellent - we share three picks! I love the direction you took this in! Great job. that would keep you occupied. love the new look of the blog. Love your picks! I had Jane Austen on my list, too, and I can't believe I forgot about Harry Potter! 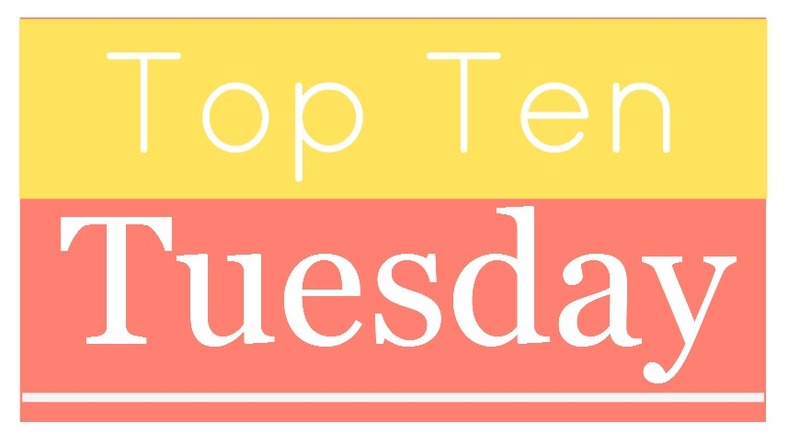 I love Top Ten Tuesday, even though it always adds to my over grown to be read list. Great choices, Jamie! Heck yeah to P&P. It's on my list too. I never get sick of Darcy and Elizabeth's story. What better time to read HP than when you're stuck on a deserted island? Also, your explanation for Fifty Shades - totally had me giggling. Great list! Which reminds me that, desert island or no, I need to read Jessica Darling. Damn these are all REALLY good choices and kind of makes me feel like I would be screwed on in island with just my list.... can we get stranded on an island together?! Hahaha, your reasons for bringing along Fifty Shades were hilarious! I definitely agree with bringing along Pride and Prejudice! I also have Lord of the Rings, Pride & Prejudice, and Harry Potter on my list. I love all the reasons/categories you set up for your list too. I loved your picks. Especially that you included a survival book too. Very important. I had a few similar picks including LOTR, Anna and the French Kiss and Harry Potter. HP and Pride and Prejudice are on my list, too. (: Love the new blog design, btw! If Harry Potter was actually one book I definitely would have picked it too! I went for His Dark Materials trilogy instead because you can get it as one :P Really liked this weeks topic! Great picks! I've read a bunch of those and I love how you broke it up. I didn't even think about fifty shades, lol, but i guess I might as well take something scandalous that I'd never read otherwise. I just decided to stick to fiction, because in reality I'd be taking all non-fiction survival guides and edible plant books lol. I totally meant to put LOTR on my list! Perhaps this should have been a Top Twenty list.. I love your list! 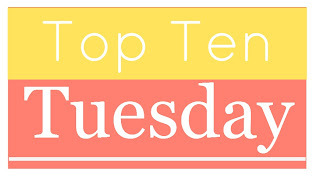 I think top ten Tuesday is such a good idea and have been trying it out on my blog too. Wow, you really thought this through. I love it! I agree about LOTR, which I have read several times as it is, and my days ould be cheered by Elizabeth and Darcy. If we're going to cheat and count a series as one, then yes, Harry Potter, another favourite, and all of Terry Pratchett's Discworld series and all of Kerry Greenwood's Phryne Fisher mysteries . that's so funny that you picked 50 shades. even if it was a deserted island, i don't know if i would bring it. Wow, I really love this topic!! I'm following your blog, and I think I'm going to put this on mine too! !